Digital Project Proposal for "The History of U.S. Paper Money, 1692 - 2002"
This site is intended for the Smithsonian Institution's National Numismatic Collection website. The site will be structured in such a way as to allow for long-term updates and additions to the content. Tell the story of paper money in the United States as represented in the National Numismatic Collection (NNC). Create the best single resource for researchers and collectors on the history of U.S. paper money. Provide a venue for the display of the Smithsonian's U.S. paper money collection and for research based on the collection. Researchers and historians. An aim of this site will be to encourage the use of paper money as primary documentation in historical research beyond narrowly focused numismatic enquiries. Examples would include the "Surviving Images, Forgotten People" page on the current NNC Virtual Exhibits section. Collectors of U.S. paper money. A major attraction of this site will be access to images and discussion of rare and hard to find currency not otherwise available to collectors. The Catalog, Paper Money Categories, Exhibits, and Collector's Corner sections will be most relevant to this audience. The forum section has the potential of providing a venue for collectors to ask questions about U.S. paper money that can be answered by NNC staff or volunteers. The general audience of website browsers looking for information on U.S. Paper money. An aim of the site would be to have it show up as a top choice on the major search engines, thus making it easily accessible to larger, less specialized audiences. The Introduction, Exhibits, and Collector's Corner would be most relevant for this audience. Students and educators interested in paper money either for class projects or for use in lessons. The Introduction, and Education sections will be the most relevant parts of the site for this audience. 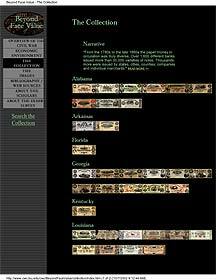 An introduction to the site consisting of a numismatic overview of U.S. monetary history with examples of the major types of U.S. paper money up to the present. This section will be fairly 'fixed' with only minor updates as new US currency is issued. A section on the historical/collector categories of U.S. currency (i.e. Colonial paper, Obsolete bank notes, National bank notes, etc.). This section will be focused on the objects and their issuance. It will be fixed in content and will form a portion of the database to which other parts of the site will frequently link. An exhibit section focusing on articles about U.S. Paper money. Presentations will concentrate on using paper money for broader historical research as well as on specialized topics within numismatics. Examples will include articles such as "Surviving Images, Forgotten People" from the existing National Numismatic Collection website. This section will grow continuously as research results in new on-line presentations. A catalog section - potentially huge, but initially to include currently available paper money from the National Museum of American History's database (Multi-Mimsy). This section will grow as the NMAH database for U.S. Paper money grows and will include images along with standard numismatic and museum identification data. An educational section that will include sample lessons and teaching aids for teachers wishing to include paper money in their teaching. Links to sites such as the "Smithsonian Center for Education and Museum Studies" will be included here, as well as a forum for discussion of U.S. Paper money. This section expand as new lessons are developed using the NNC collections. A "Collectors' Corner" section providing information on how to collect and care for paper money - this portion of the site will be similar to on the Smithsonian Center for Education and Museum Studies "Smithsonian Kid's Collecting" for which I provided images and content for the numismatic portion. III. Why does this site make sense on the Web? Paper money is not suited to extended display in exhibits for reasons of conservation and security - the web offers the ability to display fragile and valuable objects without risk of deterioration or theft. The web offers low-cost access to a much larger audience than otherwise available through print media or physical exhibits. This potential of the web dovetails nicely with the Smithsonian-wide goal of increased access to collections. The web offers the ability to include much more information than possible with traditional media. This is particularly useful in museum settings because it provides increased incentives for fully documenting objects - thus making them more accessible to the public and, coincidentally, increasing the curatorial control over the objects and their usefulness to researchers. IV. Reviews of similar sites/projects. The following sites are similar in either their subject matter or in the intended scope and structure of the site. The "'Parthia.com" is the site I would like most to emulate in scope due to its success as a resource to which anyone searching for information about Parthian history and numismatics on the web will necessarily be drawn. The site's open-ended structure lends itself to expansion, another characteristic that will be useful in the "History of U.S. Paper Money" site. Other sites reviewed are "Beyond Face Value," "Ron's Currency, Stocks & Bonds," and the Federal Reserve Bank of San Francisco's "1995 Annual Report: A Brief History of Our Nation's Paper Money." All of these present a part of the history of U.S. Paper money, but all are limited in their coverage - this site is intended to provide a more comprehensive presentation. The subheading link pages for the Currency Collection section of "Ron's Currency, Stocks & Bonds" will provide a model for the Catalog section of this site. This site is by far the largest of the sites reviewed in this essay. It is also essentially a labor of love produced by by Edward C. D. Hopkins, a retired Air Force Colonel, on an ongoing basis since 1998. This is a site that was designed from the beginning as an open-ended project that would be continuously added to as time and opportunity arose. It is the most complex of the reviewed sites in terms of its function - it includes a large database, has aspects of a gateway in its large selection of links to related sites, it is presented as a web essay on the history of Parthia as illustrated through its coinage, and functions as the focus for a virtual community for those interested in Persian history and Numismatics (directly via its Feedback page and indirectly through the Parthia-L e-group). The scholarship on this site is excellent and has been reviewed and extended by the contributions of many experts in the fields of Persian history, archaeology, art history, and numismatics. The coins are organized by ruler and by the Sellwood type ("Sellwood" refers to David Sellwood's book "The Coinage of Parthia," which is the standard reference for the series.) within each ruler heading. Each of the ruler pages includes a short biography of the ruler and a listing of known coin types from each. This data forms the basis for much of the rest of the site and forms the nexus for an intricate web of links from multiple pages. Hopkins continues to update his pages with new developments in archaeology and new coin images as they become available. He continues to receive, answer and post commentaries making this a still dynamic site over four years after it was first posted, an impressive achievement for an unsupported individual. An interesting feature of the site is the Tech Info link that leads to a page that discusses technical issues associated with posting pages on the web - examples include discussions of font compatibility, resolution and color settings for optimal viewing of the site, automated translation, etc. - a great place to learn more about potential pitfalls in web page design. Parthia.com makes excellent use of the encyclopedic capabilities of the web in pulling together a huge database of information. Despite the huge amount of information, the site is well organized and documented, including a search engine and a site map aside from the well organized navigational links. A complete reading of the site would take days, if not weeks, to accomplish. There are over 800 coins illustrated on this site with mostly excellent images designed to give examples of each type and variation of Parthian coin known, making this invaluable to the collector. Produced and maintained by the United States Civil War Center and made possible by a grant from the Louisiana Endowment for the Humanities. This site is a web exhibit focused on the images of slavery that appeared on Southern states currency before, during, and after the Civil War. The authors aim to display the images and encourage visitors to ponder the questions of why images of slavery appear on Confederate and Southern States paper money and what these images say about the authorities that produced the money. The writers of the exhibit approach the subject from a sociological viewpoint, interpreting the images and denominations that appear on the notes as windows into the psyche of the bankers, political leaders, towns, merchants and corporations that issued paper money before and during the Civil War. The intended audience is scholars and students of the American Civil War. The exhibit begins by placing money in context as culturally produced objects reflecting the identity of a people. Money is identified as a powerful communication tool capable of reaching larger audiences than any other available means. The central core of the exhibit is the catalog of currency and related documents. The site claims over 100 objects, though I could confirm only 75, each of which has been scanned and, in most cases, two images have been created - the whole notes as well as close-up scans of selected vignettes within the notes. One-line identifier labels accompany the images. The images are highlighted in two out of the available seven sections within the site: the Collection and the Images. Two sections are general essays giving an overview of the Civil War and a sketch of the economic environment of the period from 1830 to 1863. The last three sections consist of information about the creators of the exhibit, a bibliography, and an informational section about the exhibit and an electronic user-survey. The content of these sections is solid, consisting of short essays by the authors accompanied by links to off-site web pages with relevant information in further depth. Interestingly, the 'Collection' section consists largely of quotes from other reference works rather than any original work by the authors. The fact that only two of the sections of this exhibit actually deal with paper money highlights a major problem with this site - the authors do not seem to know how to use the notes at their disposal to illustrate history. The discussions of the notes are limited to descriptions of what is depicted on them with no attempt to analyze them for what they could say about larger issues of social and cultural attitudes, artistic conventions, or possible regional variations in slave imagery, to name a few possibilities. The only attempt to connect the notes to the social and cultural background of the Civil War is reached through a link off of the introductory paragraph of 'The Images' section. This is surprising as this essay is well written and speaks directly to the thrust of the exhibit, and yet is easy to miss among the choices presented to the visitor. The site is also weak in its goal of creating an educational resource - this consists of a word list at the bottom of the Overview Essay and a set of three questions to consider while studying the exhibit that are buried in the About the Exhibit section. The navigation and design of the exhibit is straightforward. However, the form of the exhibit tends to dilute the exhibit's stated message. It is difficult to figure out where to start - the eye is naturally drawn to the center of the opening page, which makes a certain amount of sense since this is where the Images section is located - but this section does not state the goals of the exhibit. Instead the closest approach to an introduction appears in the 'About the Exhibit/Survey' section at the bottom of the introductory page. Overall, this site does not make good use of new media - it fails to even make effective use of the possibilities inherent in enlarging the small images used on bank notes The bank notes are shown at approximately life-size, while the vignettes are shown in badly scanned enlargements. For purposes of this proposal, the I would like to emphasize the basic message of this exhibit; that paper money has more to say than just its printed face value. This message will be emphasized in the introduction to "The History of U.S. Paper Money" as well as in the presentations included in the exhibits section of the site. Created and maintained by Ron Pfeister since 1996. No current update information - the site does have a 2001 copyright symbol. This site is a comrehensive website about paper money from a U.S. Paper money collector's viewpoint. Ron Pfeister describes himself as a collector who also buys and sell paper money, and his site is designed to answer typical collector questions and provide a knowledge of the ways in which collectors view and collect currency. It contains relatively little history and a lot of information regarding the types of U.S. Paper money produced by the Federal government (he does not cover Obsolete or Colonial currency.) as well as their value and rarity. The history section is more of a timeline listing major events in the history of American paper money with no attempt to put them in the context of American history as a whole. The Currency Collection and Stock & Bond Collection portions of the site are neatly organized to present a maximum of standardized information in a small amount of space. The navigation for this site is straightforward, though sometimes confusing due to certain sections (compare the two sections above or the alternative home page) having a completely different look - apparently they are under construction and represent an experimental new look for the site (including new Web Site Credits and Who am I pages not originally present on the website.). "The History of U.S. Paper Money" site will incorporate the good features of this site - especially its organization of for the Currency Collection, which will be used in a slightly modified form for the "Catalog" section. Other elements will appear as well, such as a FAQ section within the "Collector's Corner." The major difference between the sites will be that "History of U.S. Paper Money" site will emphasize the history of paper money and will greatly expand on the section provided in Mr. Pfeister's site. Created and maintained by the Federal Reserve Bank of San Francisco. the web in July, 2002. Site reviewed November 29, 2002. This site represents an effort by the Federal Reserve Bank of San Francisco to reach out to a wider audience with information about the history a subject inextricably linked to but not central to their mission. 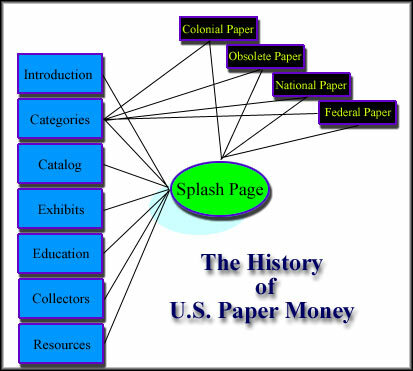 The web page as a whole consists of an overview of the history of U.S. Paper money divided into sections corresponding to the major reforms of the currency system, with the addition of a discussion of the future of money, the new look of U.S. Paper (as of 1995) and a FAQ section. It is designed to function as an on-line adjunct to an (currently closed) exhibit located in the lobby of the San Francisco Federal Reserve Bank. This site uses the format that will be used for the Categories section of the History of U.S. Paper Money. Beyond that the history presented is reasonably accurate, but sketchy on the reasons for changes that occured in U.S. currency and skips or misinterprets many parts of the history of paper money (most egregious is the impression left that only the First and Second Banks of the United States issued paper money during their charter periods - the "Free Banking" period actually extended from 1791 until the last State chartered banks stopped issuing notes in 1866). This presentation offers little to guide the proposed site other than a clean and straight-forward method of presentation. This site will use Dreamweaver 4.0 and Photoshop 6.5 to produce its images and web pages. Initially the site will use only flat html pages, though it is planned to use Access in conjunction with the Museum of American History's Multi-Mimsy database to create pages for the catalog section once the data and image files for the U.S. Paper money become available. Images will be acquired using both traditional and digital photography using the NNC collections (thus avoiding issues of copyright). VI. The home page for this site is uspaperhome.htm.